Belay Enterprises was started by Mile High Ministries in 1994 by a group of businessmen and urban pastors with a heart towards business as ministry. The faith venture organized itself around the mission of partnering with the local church to create businesses that employ and job train individuals rebuilding lives from addiction, prison and homelessness. Though its mission has remained unchanged since its early days, the organization’s priorities and strategy have changed over the years reflecting changing economic and ministry realities. Any nonprofit organization wanting to act entrepreneurially needs to keep an eye on the environment it operates and make changes when necessary. Belay Enterprises was originally conceived as an organization with several employee training businesses that would fund a central microenterprise program. Belay kicked off these efforts in late 1994 with its first business as ministry, Bud's Warehouse, as well as making some initial micro-loans to urban businesses. Unfortunately, Bud's rather quickly did not hit its earning business plan projections and started using its cash reserves quickly. Over the next five years, Bud's fought for its survival by burning though lots of financial donations...money that the organization had hoped to lend out to other businesses. In 1998, Belay embarked on a new strategy by temporarily postponing its microenterprise efforts in order to focus on the business of Bud's Warehouse. Over the next 3 years, that retrenchment was successful with Bud's beginning to make significant profits that could now be reinvested back into the mission. Now the organization faced a decision on how to best pursue its mission into the next few years. Belay choose to expand its employee training business operations by starting Baby Bud’s, a baby thrift store that employed single mothers. A few years later, Belay assisted Marc Veldhuizen in expanding his car placement ministry into a new faith venture called the Good Neighbor Garage. Baby Bud's soon started Freedom Cleaning Services. While these employee training business were being started, Belay attempted to make some micro-loans to a few for-profit businesses without too much success. The experience of these years taught the organization that a strategy of incubating faith ventures was the best approach for the future. As the organization enters its 15th year, Belay hopes to continue this strategy of using its resources to incubate faith ventures. After these ventures become self-sustaining, we will spin them off into their own organizational entities and then refocus resources on other start-ups. Belay is bullish on the prospects of faith ventures when Godly men and women are empowered and then set free to run their own operations. A couple of years ago, I made a very bold prediction that I wanted to see Belay create 100 businesses over the next five years. We are not going to achieve that goal without making a sizable paradigm shift. If Belay prides itself in being an entrepreneurial organization, we need to migrate from a model of internal incubation to a model of external collaboration and inspiration. I really believe in the positive power of faith ventures on behalf of disadvantaged communities. I also know that there are lots of talented Christ-following entrepreneurs out there looking for opportunities to use their gifts and talents on behalf of the kingdom. 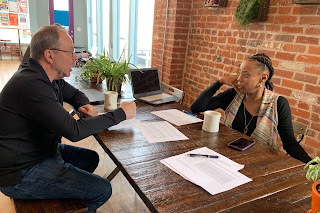 Over the next five years, I hope to lead Belay and other organizations towards connecting entrepreneurs with faith venture opportunities to create real change for individuals rebuilding lives. Hi i read your blog,your blog is very informative thanks. this blog is very informative about business.